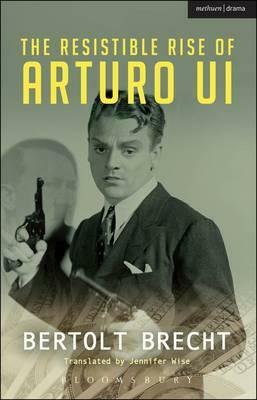 Described by Brecht as 'a gangster play that would recall certain events familiar to us all', Arturo Ui is a witty and savage satire of the rise of Hitler - recast by Brecht into a fictional, small-time Chicago gangster's takeover of the city's greengrocery trade in the 1930s. The satirical allegory combines Brecht's Epic style of theatre with black comedy and overt didacticism. Using a wide range of parody and pastiche - from Al Capone to Shakespeare's Richard III and Goethe's Faust - Brecht's compelling parable continues to have relevance wherever totalitarianism appears today. This version of The Resistible Rise of Arturo Ui is by Canadian theatre academic Jennifer Wise. Bertolt Brecht (1898-1956) is acknowledged as one of the great dramatists whose plays, work with the Berliner Ensemble and writing have had a considerable influence on the theatre.Jennifer Wise is Associate Professor in the Department of Theatre at the University of Victoria, Canada. Her books include Dionysus Writes: The Invention of Theatre in Ancient Greece, The Broadview Anthology of Drama (as co-editor) and Hudson's Bay Journals (as illustrator). Her essays are published in such venues as Theater der Zeit Recherchen, Reader's Digest, Theatre Survey and Arethusa.